It's that time again! Registration is now open for Fall 2014 training here at the PPS office in New York City. 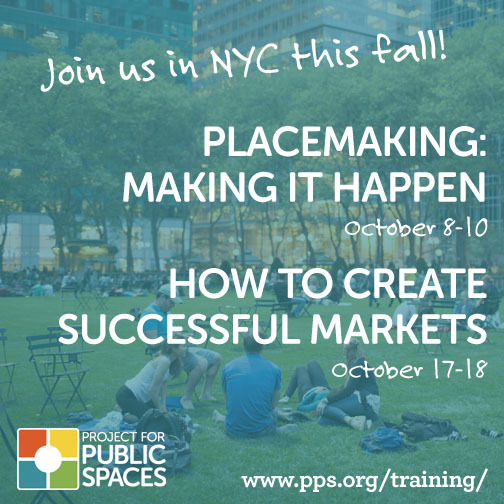 This year you can take part in two excellent training courses: Placemaking: Making it Happen and How to Create Successful Markets. Both offer a plethora of practical information aimed towards students and professionals alike looking to bring Placemaking into their communities. Read on for more details about each and to register today! Placemaking: Making it Happen is an intensive two and a half day course that builds on participants’ knowledge of Placemaking concepts and provides the tools to implement and manage Placemaking projects. Speakers include individuals who have direct, hands-on experience in Placemaking across the country and many of the presentations will focus on recent success stories. The course will begin with an overview of Placemaking theories and methodologies, a description and interactive activity of Placemaking tools and techniques, and multiple presentations to provide participants with creative ideas for implementation and management of their Placemaking projects. Click here to see a sample agenda and register here by October 1st. How to Create Successful Markets is a two-day training course where participants learn the essentials for creating a thriving public market that is economically sustainable, maximizes community benefits, and contributes to the creation of public places that attract a broad diversity of people. Participants will learn the essentials for creating an extraordinary public market during work sessions and on-site tours of New York City’s thriving open-air and indoor public markets. Your instructors for this course are Steve Davies, David O’Neil, and Kelly Verel.